Google has set up its own car company. The tech giant has flirted with major car firms as it explores driverless cars but has also quietly set up its own auto company, according to documents obtained by the Guardian. To date, no such partnership has emerged. That might be because Google already has its very own car maker in Google Auto. The company is registered with national and international organisations as a passenger vehicle manufacturer, and was licensed last year as a car maker in California. Google declined to comment on this story. Documents obtained by the Guardian under a Public Records Act request in California show that Google Auto was formed as a limited liability company in late 2011. Initially, Google used it to modify and test the fleet of driverless Lexus SUVs that succeeded the company’s first self-driving Prius saloons. 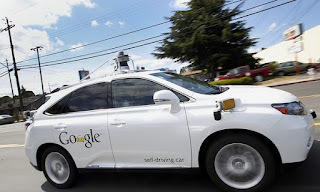 Google Auto is named as the manufacturer of all 23 autonomous Lexus cars registered with California’s department of motor vehicles, including all the vehicles involved in a recent spate of minor accidents in and around Google’s home town of Mountain View. But as Google’s ambitions for its self-driving technology grew, so did Google Auto’s role. In late May last year, Chris Urmson was appointed manager of Google Auto, taking control of day-to-day operations of the company. The very next day, Google announced that it was going to build 100 prototype self-driving cars from scratch, without steering wheels, accelerator or brake pedals. In correspondence with Mark Rosekind, administrator of the NHTSA, Urmson insisted, “Google Auto LLC has not offered any of its LSVs for sale, and it does not plan to do so.” This is not surprising. With Google so far ahead of other car makers in developing self-driving systems, it would be unlikely to market experimental vehicles packed with cutting-edge technology.